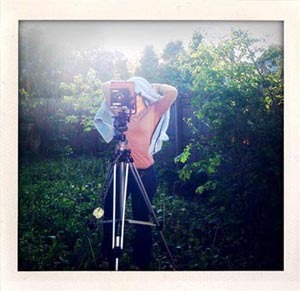 Christine Shank is an artist working predominantly in photography. She has exhibited in both solo and group exhibitions throughout the United States since 1998 and her artwork is in the Harry Ransom Center and the William Benton Museum of Art as well as several private collections. Shank has been an artist-in-residence at the MacDowell Colony, Constance Saltonstall Foundation for the Arts, Kimmel Harding Nelson Center for the Arts and the SIM Residency in Reykjavik Iceland. A selection of her “Interiors” series was published in 2008 through Booksmart Studios in a limited edition monograph titled She Quietly Considers. Shank has received funding through The Connecticut Commission on Culture and Tourism, New York Foundation for the Art’s Strategic Opportunities Stipend and The Midwest Center for Photography. Christine Shank has a BFA in photography from Miami University of Ohio and a MFA from Texas Woman’s University in Denton, Texas. She currently lives in Rochester, New York where she is an Assistant Professor and the Director of the MFA program in Imaging Arts at Rochester Institute of Technology. All content of this site is © Christine Shank, all rights reserved.